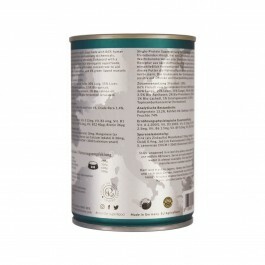 Certiﬁed organic complete wet food for adult dogs. 100% human grade carefully selected ingredients of the highest quality create this scientiﬁcally formulated single protein, additive-free superfood for your best friend. Gently poached to preserve vital nutrients and vitamins, this unique recipe includes 86% wild venison, using a ﬁne balance of only muscle meat and vital inner organs. Essential additional nutrients are provided through a carefully formulated mix of bio-organic superfoods, including sweet potato, apricot, spinach and lingonberries, creating a balanced and delicious superfood with multiple health beneﬁts. This recipe has been enhanced with fermented Jerusalem artichoke concentrate, which has a highly beneﬁcial prebiotic effect to aid digestion and your dog’s ability to absorb the nutrients in this recipe, together with lingonberries which can have a positive effect on your dog’s renal system. Green lipped mussels and bio-salmon oil are added for glucosamine, chondroitin and Omega 3 & 6 fatty acids for the beneﬁt of your dog’s joints and ligaments. Sound of Game represents A Taste of Salzburg, and is inspired by The Rockster’s Journey. 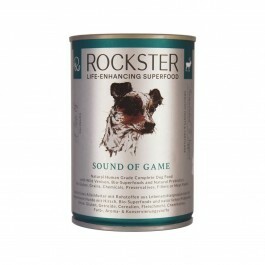 What is in Rockster Sound of Game? Ingredients: 86% Wild venison (40% Muscle meat, 30% Lung, 15% Liver, 15% Tongue), 4% Bio-sweet potato, 3.5% Bio-apricot, 2% Bio-lingonberries, 2% Bio-spinach, 1% Bio-salmon oil, 1% Green lipped mussels, 0.5% Bio-fermented Jerusalem artichoke concentrate. Nutritional Additives: Vit. A 2.200 IU, Vit. D3 200 IU, Vit. E 12mg, Vit. B2 6mg, Vit. B1 2.5mg, Vit. B6 1.5mg, Vit. B9 0.3mg, Vit. B12 40µg, Biotin 36µg. Trace Elements per kg: Zinc (as Zinc sulphate monohydrate) 10mg, Manganese (as Manganese-II-oxide) 0.9mg, Iodine (as Calcium iodide) 0.38mg, Selenium from S. cerevisiae CNCM I-3060 (selenium yeast) (3b8.12) 0.09mg.